Stand Up Paddle Boarding at “The One Lane Bridge” is a must-do Pacific Northwest paddle destination! Recently remodeled, the gravel parking lot has been enlarged and the rudimentary steps leading down to the water have been replaced with modern galvanized steel steps including a nice concrete landing to launch your paddle craft from at the bottom. Located just before the turn off for both Cresap Bay and Saddle Dam recreation and boat launches, The One Lane Bridge offers a unique opportunity for paddlers to launch without being stuck next to all the motorized power boats & jet-skis. Originally built as an exit point for Kayaker’s paddling down the rapids of Canyon Creek, The One Lane Bridge access is now a popular spot for paddlers of all types, including SUP paddlers! 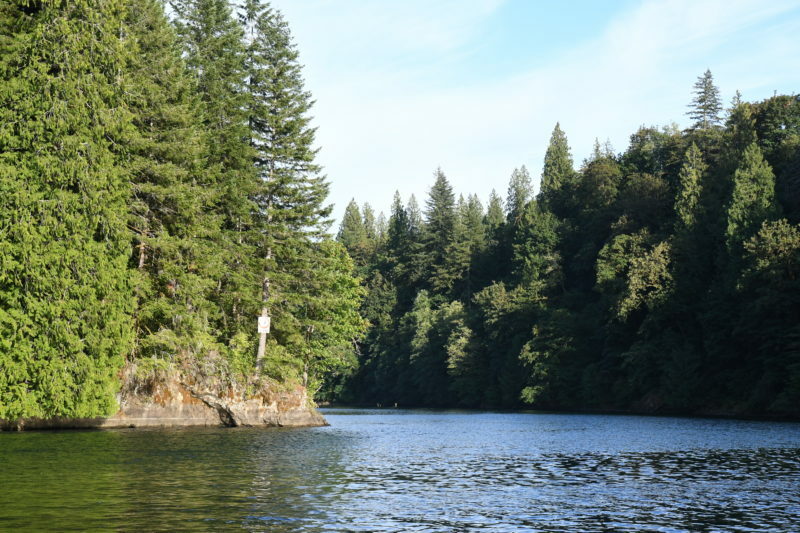 At the bottom of the concrete landing, if you take a left turn leaving the launch you will find yourself paddling into the wide open spaces of Lake Merwin and eventually see Cresap Bay on your right. 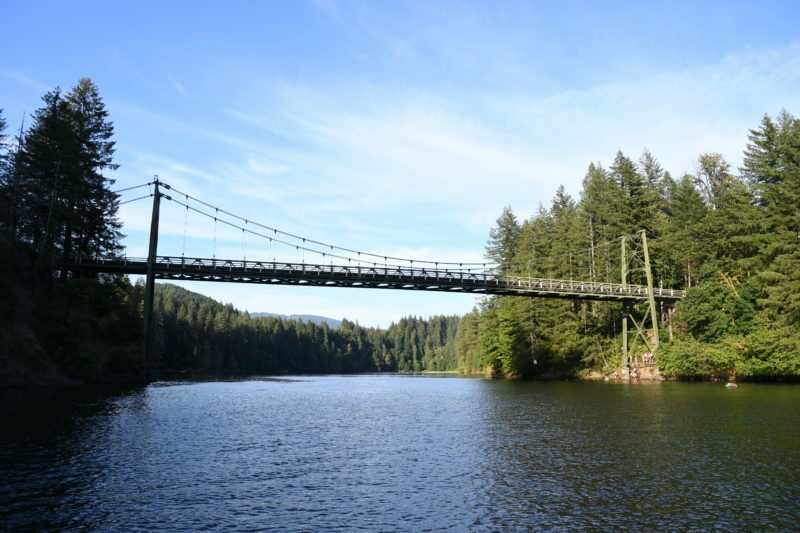 Although there’s certainly nothing wrong with paddling Lake Merwin, the true beauty of The One Lane Bridge is taking a left leaving the launch pad and paddling downriver towards the Merwin Dam. 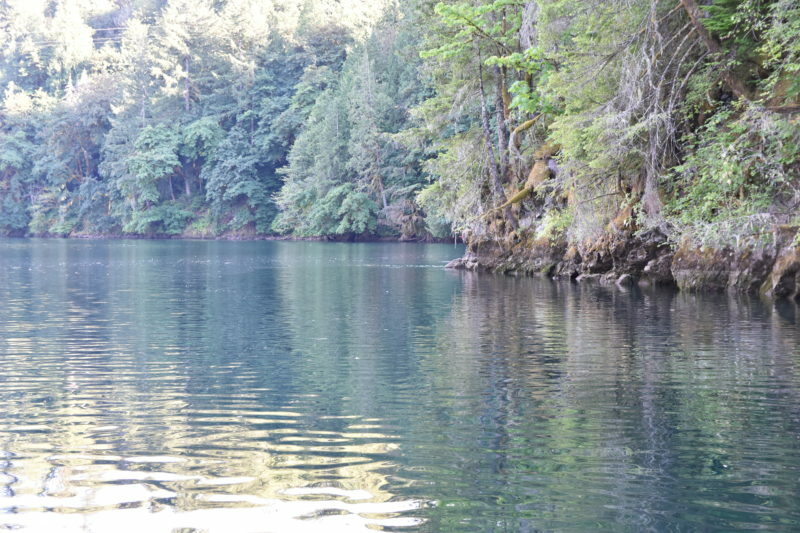 Once you reach the roped off section prohibiting paddlers from getting to close to the Dam, you will hook a right and leave the Lewis River to begin your upriver paddle into Canyon Creek. 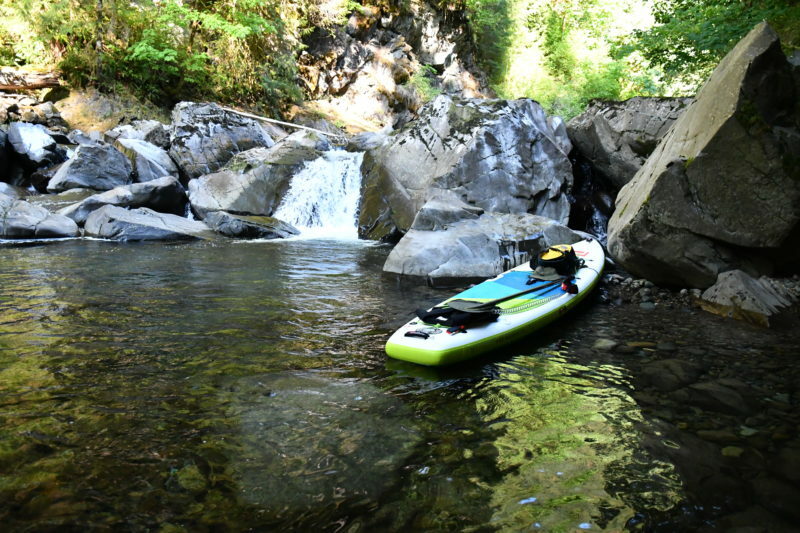 Don’t stress about the “upriver” part, it’s very mellow paddling conditions suitable for all skill levels! All along your journey down the Lewis River and eventually paddling up Canyon Creek, you’ll see all kinds of Pacific Northwest beauty! Abundant wildlife including river otters, osprey and many other types of birds, trout and other fish, and maybe even the elusive Tiger Muskey! Small waterfalls and streams enter the river on both sides, making for tons of great photo ops. 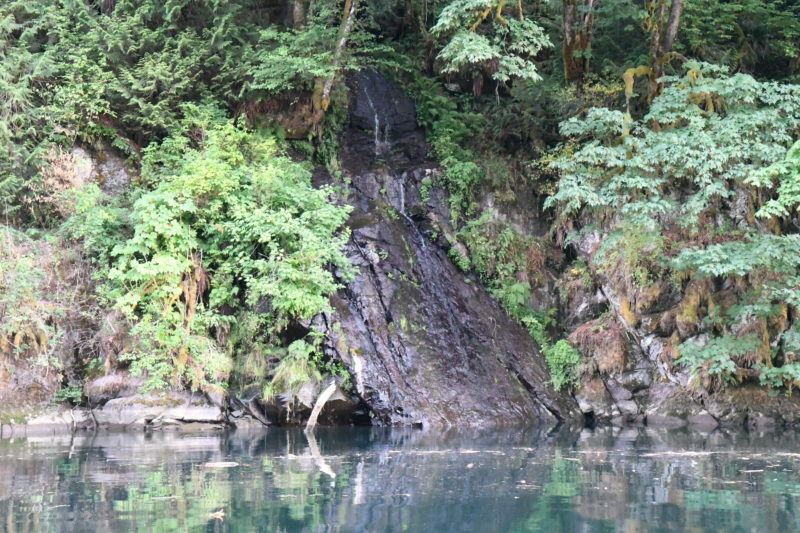 It’s well worth the effort to paddle all the way to the “end”, where you will find the gorgeous Canyon Creek Falls. Smaller waterfalls than some, but beautiful nonetheless and a great place to take a break. Round trip from One Lane Bridge to Canyon Creek Falls and back to The One Lane Bridge is approx 2-3 hours at an average leisurely paddle pace. There are no restrooms or improvements of any kind at this SUP Destination! Plan ahead, bring plenty of clean water. Aside from extra busy Holiday weekends, we’ve never had an issue with finding a parking space. I would NOT try to bring any type of trailer to this SUP Destination, there isn’t enough room for any kind of turn around and it would be considered poor manners to take up the extra parking spots. Please keep in mind, you will need to pack your Paddle Board and all your gear down roughly 4 flights of metal stairs. There is no handicap access, and no easier way down to the water.